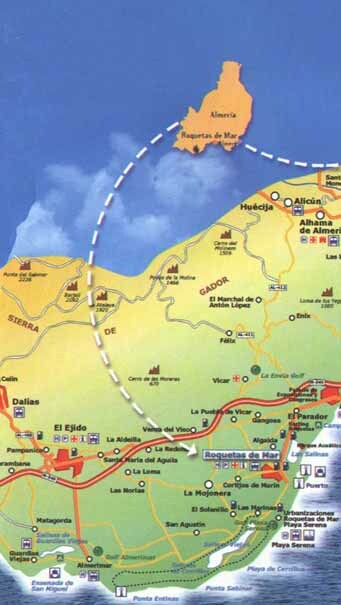 In the map we can see in red the national road N-340, bordering the Mediterranean coast and passing near Roquetas de Mar, further up we detail the main points of interest like gas stations, hotels, bus stops and attractions near Roquetas. Roquetas is situated about 25 km from Almeria and is well known for its golf courses and water sports during the summer. If you want to know more about Roquetas de Mar, feel free to visit our city guide.